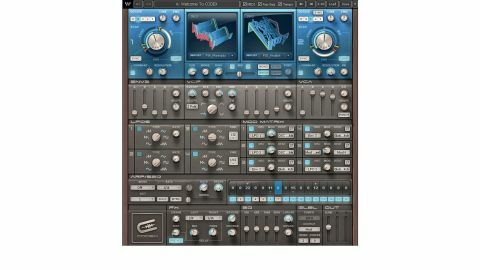 Waves might not have done much new with its second synth, but the oscillators are flexible and it's really easy to use. Easy to get to grips with. Some pretty good presets. Create your own wavetables. Expensive for what it is. Quite limited. Oscillators can sound a bit cheap. Very similar to Element, for the most part. Billed as "an advanced granular wavetable synthesiser", Codex (VST/AU/RTAS/AAX/standalone) is designed to produce complex timbres that evolve over time. Visually, the oscillators use a striking 3D wavetable view, which is spookily similar in appearance to Xfer Records' Serum. Neither company can lay claim to the style, however, which is ultimately inspired by the original Fairlight CMI hardware sampler series. "Nearly everything in Codex, other than the wavetable oscillators, is functionally identical to Element"
Aside from their wavetable functionality, the oscillators can be tuned (octaves, semitones and cents), and Oscillator 2 can be hard synced to Oscillator 1. Osc 2 also sports an FM control, enabling it to act as a carrier, again modulated by Oscillator 1 - this serves Codex well when it comes to producing rich tones. And finally, the Unison button activates/deactivates the voice doubling mode, which sounds OK, although we would have liked more options in this area, such as stereo spread, detune and number of voices. It's all fairly good stuff so far, but having been somewhat underwhelmed by Waves' first synth, Element, due to its lack of innovation, we're even more disappointed that, almost two years on, their latest offering hasn't moved things on much at all. Nearly everything in Codex, other than the wavetable oscillators, is functionally identical to Element. The VCA section, for example, comprises a basic ADSR envelope with controls for velocity and shape (altering the curvature), which is repeated in the filter section and as the third, assignable "Envelope 3" - just like Element. Codex even has the same Punch button in the VCA section, which seems to deactivate a softening of the attack that's otherwise on by default - just like Element. As well as the envelopes, the filter, LFOs, Mod Matrix, Arp/Sequencer, FX and EQ feature the exact same controls as Element, albeit arranged differently on the interface and tweaked graphically. The song remains the same So, if you're familiar with Element, you can skip straight to the conclusion. For everyone else, let's run through the rest of the feature set. Codex sports a single filter with cutoff, resonance, envelope amount, keyboard tracking and FM from Oscillator 1, and a choice of high-pass, low-pass, band-pass and band-reject filter types, with 12dB/oct and 24dB/oct slopes. It's a very basic setup that seems needlessly outdated in comparison to the ultra-flexible filters on most new synths these days - particularly at this price. "It feels like Waves has been a bit cheeky in making no fundamental changes to its synth engine for Codex"
The four LFOs each offer five waveforms, plus sample and hold; two run free, the other two can be synced to host tempo or the internal clock in standalone mode. The Mod Matrix has six slots with all the source options you'd expect (LFOs, envelopes, step sequencer, etc) and plenty of destinations. The Arp/Sequencer has five modes: Up, Down, Up/Down, Random and Sequence (+/-24 semitones). One handy feature is the ability to lock the sequencer so that you can switch presets but retain the current sequence. The FX section is very rudimentary, with lo-fi Crusher, Distortion, Chorus, Reverb and stereo Delay modules. The Crusher, Reverb and Chorus are all one-knob affairs; the Distortion can be placed pre or post filter, but other than that is also controlled by a single knob. None of the effects sound particularly special, and the built- in EQ is similarly lacklustre, with its four fixed bands, plus high- and low-pass filters. Comparing it side-by-side with Element, it feels like Waves has been a bit cheeky in making no fundamental changes to its synth engine for Codex. The oscillators are the only thing that sets the two apart, so Codex has the overall advantage, with its wavetables covering far more sonic ground than Element's basic VA equivalents. Indeed, we certainly couldn't recommend buying both synths, since Codex can do pretty much everything Element can and more besides - even though Codex's oscillators are unmistakably 'digital', lacking the depth, sweetness and analogue realism of Element's. On its own terms, Codex sounds pretty good and has plenty of solid presets for the casual user, an easy workflow for the slightly more advanced synthesist, but sadly not nearly enough in the way of sophisticated features to tempt the power user. Thanks entirely to its wavetable capabilities, it's capable of knocking out adventurous synth timbres via a fun workflow without too much effort, but you might want to have a look at what else is around in its category before settling on it.